This summer I decided that I wanted to see more seabirds in life. Despite having the new Noctivids already in my possession since the official launch at the British Birdfair, lack of time made sure the bins hadn’t left the bag. After the birdfair there are just so many things to follow up, that me and my bins needed a break to go out and play. So on the 29th of August this year I arrived on Grasioca, one of the smaller islands of the Azores, of course equipped with the brand new Leica Noctivid 8×42. What better way of giving the new optics a real test in harsh conditions on some cool birds. Situated in the middle of the Atlantic Ocean, way off the coast of motherland Portugal, the Azores are home to some special breeding seabirds. Furthermore, the sea is very rich in terms of cetaceans. Besides, during the migration period many migrant seabirds are present and there is always the odd chance on a true vagrant. And this 3 day pelagic was organized just for this cause. WP twitchers from all over Europe were most prominent on board, hoping to tick a new bird for their WP life list, and hopefully gripping off their friends back home. The good thing from this peleagic is that Graciosa is home to the only breeding colony in the world of the recently described Monteiro’s Storm-Petrel – making sure that during this trip you always have 1 lifer under your belt. Besides, during this period the ultra-similar Grant’s Storm-Petrel are also present around the island – as they breed later in the year in the same colony. Marriage and raising kids does the plumage of the Monteiro’s no good – they stand out of being very worn contra the crisp Grant’s, one of the ID tricks to seperate these species. The superb Noctivids helped very much during the ID – as the Leicas performed brilliantly during the pelagic. Especially the combination of the proven minimisation of the globe effect applied in other Leica binoculars and the sophisticated positioning of the baffles, ensures an unequalled image plasticity. 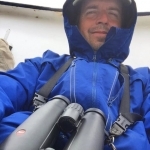 That is a big bonus at sea as it means in most cases you don’t have to change the focus at all as the field (actually sea) is sharp from the horizon to most flying seabirds up close – except the ones that almost flew in the boat, heading towards the chum on the stern. The whole 3 day pelagic is one big birding fiesta. Besides the two species of Storm-Petrels we also saw several Wilson’s Storm-Petrels and many Great & Sooty Shearwaters – all three breeding on the other side of the Atlantic, some even as far as Antarctica. Mindblowing if you think about it, but on deck no time as birds where in sight most of the time. Undoubtedly the highlight was the enigimatic Swinhoes Storm-Petrel, one of the major targets for most birders on board. As the Swinhoes had been seen during each 3-day peleagic in the last five years, they must be resident somewhere near. Two Desertas (type) Petrels also joined the party on a windy day, raising hope for even a rarer Petrel, but that didn’t happen. There is always a next time! Ceteceans perfomed at intervalls as well, with a group of showy Striped Dolphins stealing the show. As most small islands in the world, landbirds on the Azores are not well represented. As it is in the path of most depressions from the USA, North-American waders are a common sight and good compensation if you ran out things to do on the Azores. Especially Terceira has a awesome waderspot where during my stay five to six species of North-American waders were present (seven, if you include Sanderling, it breeds on Greenland – we can hardly call this European, even if it is a common bird on Europe’s coasts). For me this was a good reason to stay two extra days in the Azores.